Eject the drive that the program is running from. Eject a drive by specifying a drive letter. Eject a drive by specifying a drive name. Eject a drive by specifying a partial drive name. When run as a ‘normal’ GUI program the tools enables USB devices to be quickly ejected through a mouse click or keyboard press. 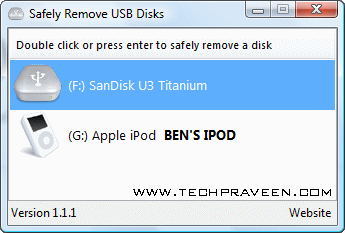 It’s especially useful when dealing with multiple USB devices and for Vista users who don’t want the ‘now safe to remove this device’ dialog box to appear.